100 Word Challenge for Grown-Ups! Are you a frustrated writer? Is there a novel inside you trying to see the light of day? Do you dread the blank page and the thought of 1000s of words? Would you like some constructive feedback on your creative efforts? 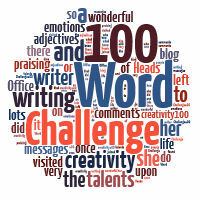 100 Word Challenge for Grown Ups! It will follow the same format of a given prompt of a few words or a picture. You then have 100 words to write a creative piece which you link to the blog. You then visit and comment on other entries. It is the visiting and constructive comments that make it special and bring real improvements to the writing. Click HERE for your first prompt and let those creative juices flow! Great idea Julia. Not sure I have the talent / imagination to join you though. I wonder if it will be as popular as the kids one? Well, the rumour has it that some of the teachers feel they should take part to be role models! We’ll see!